Well today was certainly different. Out of the ordinary. But before that, last night. Nothing happened. I watched Close Encounters of the Third Kind the director’s cut, and the director of course was Steven Spielberg. Some added scenes, some make out session between Teri Garr and Richard Dreyfuss, some Melinda Dillon walking through the woods looking for her wayward son. It still is one of my favorite movies from when I was growing up. A perfect movie for a 15 year old me. And of course, if given the chance I too would go off with the aliens in the end. The trick is would I go through all that Melinda Dillon and Richard Dreyfuss went through to get to Devil’s Tower? Would I have felt that compulsion or would I have quit halfway there. Perhaps if Bill or Julio were with me egging me on I would have gone the whole route, if left on my own I’d probably fall asleep on the rocks like the third guy running with Dillon and Dreyfuss..
Bill came home, feeling tired but wound up watching the movie until the end since he had never really seen it before. He went to bed soon after and so did I. This morning Bill kissed me goodbye as I lay in bed and I wasn’t too pleased about being awoken. No cursing or anything like that but I’m sure I gave him the infamous glare of my father. He shrugged it off since he’s basically used to it and the glare has no effect unless you were brought up under that glare. 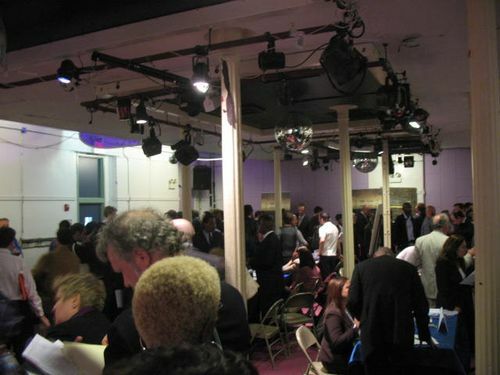 I had a tentative plan to go to a Job Fair today at the LGBT Center in west 13th street in the Village. I had heard and seen on TV that these job fairs are usually very crowded and that planted a seed of not wanting to go in my head. Then it started to rain a bit and that made me not want to go in. Still I searched around the apartment for some résumés Bill had printed for me. Of course I couldn’t find them and the website suggested bringing 40 copies since there would be 40 companies looking for people just like me. I decided that since the résumé was online I would be able to log onto Bill’s Mac and just print it out from there using his printer since my computer cannot access his printer. I was thwarted in that since every time I tired to log into my gmail account I was asked to log into Optimum Online. I asked Bill what his password was but he didn’t know since he never had to do that before. Bill suggested that he could print it from his office and I could just pick it up from there. Well that was nice of him to offer, but I was just hoping to take the Path train in and walking over to the LGBT Center from the Path station. I wasn’t planning on heading into the city on the bus and then taking a subway downtown since the Center was only a block away from the Path train. I headed out, saw Stine and Alexander. Stine said I looked good and asked where I was going. I told her my printer woes and she said I should have just asked her to use her printer. I didn’t know she was a round or else I would have. So I followed Bill’s suggestion and hopped on the bus. Found Bill outside his building. He said I looked sharp in my new suit. It was a suit I purchased before I lost the last job and finally had a reason to wear it. I have to admit it was good to wear a suit and tie again. Felt good too. No more slouching when I walked, wearing a suit, at least for me, commands me to walk shoulders back, chest out, head up, looking forward. After seeing Bill, I hopped on an express train to 14th street and walked over to the Center. The line wasn’t that long, I pre-registered online so I was taken care of. 3000 people did the same. 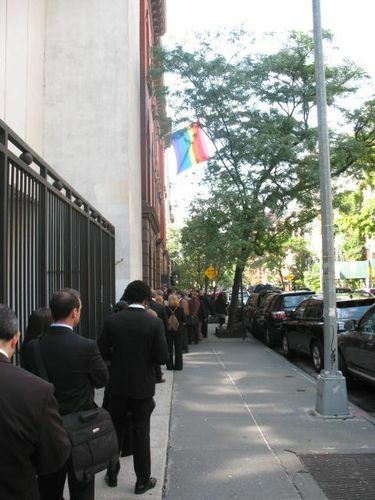 If the line went around the Edward and Theresa O’Toole Building on 7th Avenue I would have kept walking but it wasn’t that bad. Only on line outside for about 20 minutes. I did make the mistake of getting online inside for the A&E Networks table which was quite a long line. 30 minute wait for a 30 second handshake and a suggestion to visit their website in 30 days. A&E is merging with Lifetime TV so they need to clear out the people working for decent salaries so they could hire people just like me for half the cost of their soon to be former employees. More lines on 2 different floors and I did my best and handed in about 5 résumés. After an hour I left. I thought it odd that one of the company tables was for Whole Foods which is currently being boycotted by several groups since John Mackey, CEO and co-founder of Whole Foods wrote an op-ed in the Wall Street Journal on August 12, 2009 quoting Margaret Thatcher and suggesting that healthcare is a commodity that only the rich, like him, deserve. An he’s an Ayn Rand follower. But that’s a different battle.They were handing out free bottles of cold water which was nice but the water was tainted with an Rand like aftertaste. I decided to walk down to the World Trade Center Path station and enjoyed one of the cigars Bill gave me for my birthday. This entry was posted in Interesting Things as of Late and tagged Bill, Close Encounters of the Third Kind, Job Fair, LGBT Center, Printers, résumé on September 17, 2009 by johnozed.